SEO measurements can determine the effectiveness of a search engine optimization project. 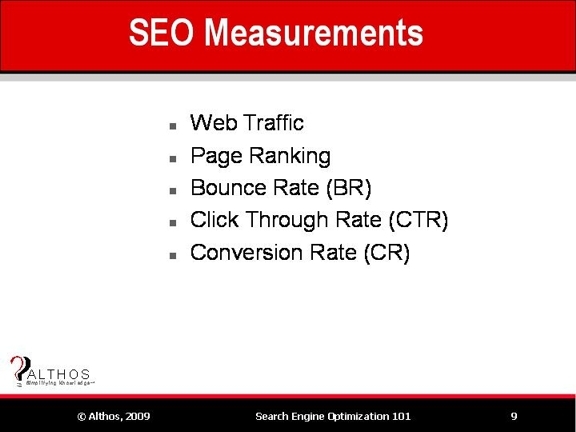 SEO measurements may include web traffic, page rank, bounce rate (BR) click through rate (CTR), and conversion rate (CR). Web traffic is the amount number of people who visit web sties. Web traffic can be classified into categories that include number of number of web page components that are requested (hits), number of web pages viewed, and number of unique visitors. A site visit is usually defined to be the connection of a user to a web site regardless of how many web pages the visitor viewed on the site. Web page ranking is the relative position of a web page URL in search engine results window compared to other URLs. Page ranking may be determined by site value or site popularity. Google (www.Google.com) page rank (0-10) identifies the site value as compared to other sites and a higher Google page rank value is better. High Google page rank does not indicate high traffic levels to the web site. Alexa (www.Alexa.com) web site rank (site popularity) identifies the site popularity (traffic) of a web site and a lower Alexa rank is better. A low Alexa number indicates a web site has more traffic. Alexa ranking can take months to change. Bounce rate is the number of visitors that either leave a page or remain idle beyond a certain length of time without visiting any other pages, relative to the number of total visitors. A high bounce rate indicates a mismatch between the search optimization and the visitor needs. Click through rate (usually in percentage form) is a ratio of how many clicks a link or advertising message receives from visitors compared to the number of times the link or advertising message is displayed. An example of click through rate is a link that is clicked 5 times out of 100 displays to visitors is 5%. Conversion rate is a measure of the people who log on to a web page and select a process or purchase via that web site. A high conversion rate percentage usually indicates high content relevance as the content is meeting the visitors’ needs.